Week 13 of the Caption CERN Contest might be gone, but our intrepid scientist is still rocking his caffeine rush. Thanks for the captions! We’re still trying to figure out if the faces in on the wall are anyone famous – and who exactly are in the cartoon postcards toward the top of the wall. A few readers picked up on what looks to be a compressed air hose in the background. 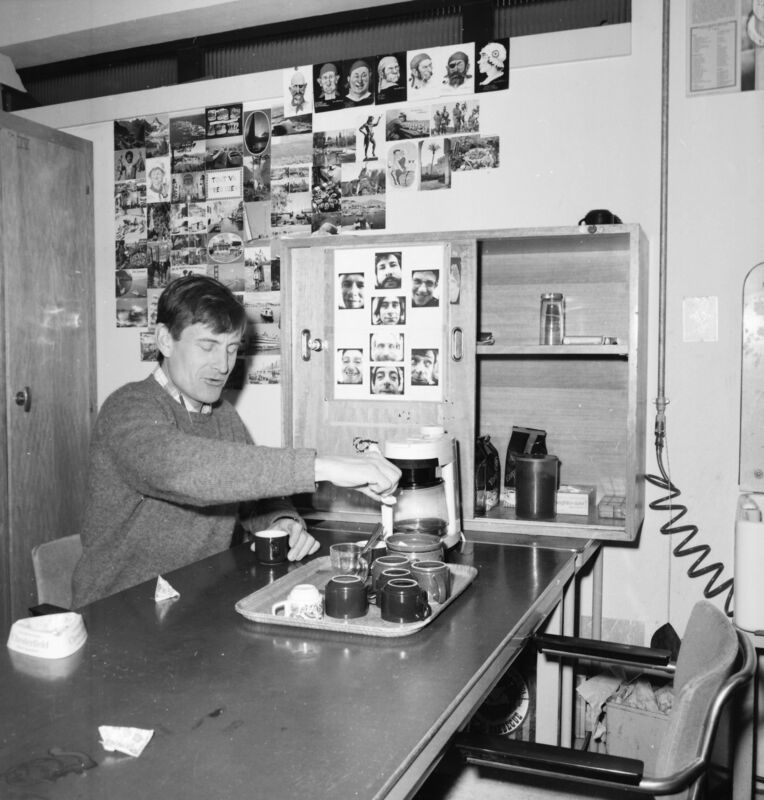 Every office has their coffee station, but we’re betting this particular CERN lab had some seriously frothy milk! The winner for this week is [Matt] with ‘”this is going to make one gooood coffee rush selfie. All my friends are doing it. We post them on the wall.” – CERN staff really were ahead of their time.’ [Matt] won a sweet Robot Head T-Shirt From The Hackaday Store! We’ve seen a lot of strange equipment here at Hackaday, but Week 14’s image left us at a loss for words, at least for a few minutes. What the heck is this thing? Pressure vessel? RF chamber? Looking at this image and another one depicting a strange device in CERN’s labs, we haven’t the foggiest idea. We do know it’s large, and these two CERN scientists are working hard to get it ready for… something. It also has fins. Fins make everything cooler. Beyond that – we’re leaving this one in the capable hands of our caption team on Hackaday.io. We’re sweetening the pot a bit this week. Up until now, our weekly prize has been a T-shirt. While clothing is important, we know that hackers love hacking tools, so this week’s prize will be a Bus Pirate from The Hackaday store. We’ll try to change it up each week with a different device. Add your humorous caption as a comment to this project log. Make sure you’re commenting on the contest log, not on the contest itself. As always, if you actually have information about the image or the people in it, let CERN know on the original image discussion page. Week 12 of the Caption CERN Contest and the strange stringed scientific instrument it brought along are both history. As always, thank you for your captions! They provided quite a few chuckles in the busy week gearing up for our Hackathon. We’re still not sure exactly what is being built here – Our best guess is it’s some sort of detector for emissions. But what sort of emissions? Was CERN looking for electric fields, magnetic fields, or something else entirely? It’s interesting to note that just as the photographer’s flash reflected in all 5 layers of wire, an RF signal would bounce off the rear reflector and strike the wires. The winner for this week is [THX1082] with “CERN’s early attempts at developing “String theory”. They’re doing it wrong. [THX1082] will be at his next hackerspace meeting wearing a CRT Android T-Shirt From The Hackaday Store! Week 13: Coffee time at CERN! Every week we get at least one caption explaining that the strange piece of equipment included in that week’s image is a coffee maker. I thought it would only be right to include this shot of CERN’s real coffee nook, and a scientist about to enjoy a fresh cup of liquid “get ‘er done”. I have to thank CERN’s photographer for grabbing this slice of life shot! It’s worth taking the time to check out the high res JPEG direct from CERN, as you can really zoom in on the post cards and photographs in the background. One even says “Tout va tres bien” – which Google translates to “Everything is going very well”. Some jokes never get old! Week 11 of the Caption CERN Contest has flown by faster than the mullet or hammer pants. Thank you for all the wonderful captions. 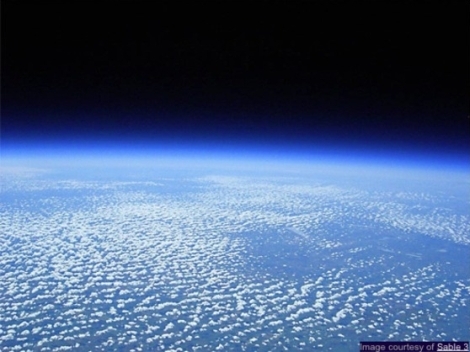 Some of our astute readers noticed that this week’s photo actually worked as cross view 3D image. This was unintentional, but a pretty cool bonus. The telephone in the background moved just enough to give the image some depth. We probably will never know what exactly these scientists were working on, and why they needed a PDP 11 with some custom hardware to run calculations. They definitely provided us with some entertaining captions though! The winner for this week is [XLT_Frank] with “These ladies were essential to proper operation at CERN because unlike the men, they read the manuals”. As a reward for his efforts, [XLT_Frank] wins a CRT Android T-Shirt From The Hackaday Store! One of the best parts of running the Caption CERN Contest is checking out the new images on CERN’s servers each week. Every week I find new images to zoom in on. I trace wires, look at equipment ID cards, and generally try to figure out what exactly is going on. This image is no exception. At first glance, one would think the CERN photographer was trying out some multiple exposure techniques. Zooming in on the high res JPG available at the original CERN page shows that the strange phenomenon in the center of the image are actually layers of fine wire strung between the two sides of the curve. Between that and the 80’s clean room outfits, this must have been a very important piece of scientific equipment! If you haven’t looked around the RepRap project in a while, you probably haven’t heard about the Smoothieboard. It’s an extremely unique electronics board for 3D printers, laser cutters, and CNC machines that is trying to get away from Atmel and AVR microcontrollers and towards more powerful ARM micros. On the Smoothieboard, you’ll find enough five motor drivers, six big ‘ol MOSFETs for hot ends, fans, and beds, enough thermistor inputs for just about anything, and an Ethernet jack, because all 3D printers should be able to run headless. The team behind the Smoothieboard has decided there’s not enough awesome included in the Smoothieboard already. To fix this, they’re opening up a contest where coders, documentarians, graphic artists, and creatives of all types can contribute to the Smoothieboard project. What’s the prize? A Smoothieboard, duh. The Smoothieboard team is looking for a few good coders, builders, or anyone else to contribute to the Smoothieboard project. If you have an idea that would work with the Smoothieboard – a web interface like Octoprint running on the Smoothieboard, better documentation, graphics, or just want to build a five-axis CNC mill, this is where you sign up. The prize is a Smoothieboard 5XC, the top of the line board with five motor drivers. Of course you’re always welcome to not contribute to open source projects, and for those consummate consumers, we have the Smoothieboard 5XC available in the Hackaday Store. 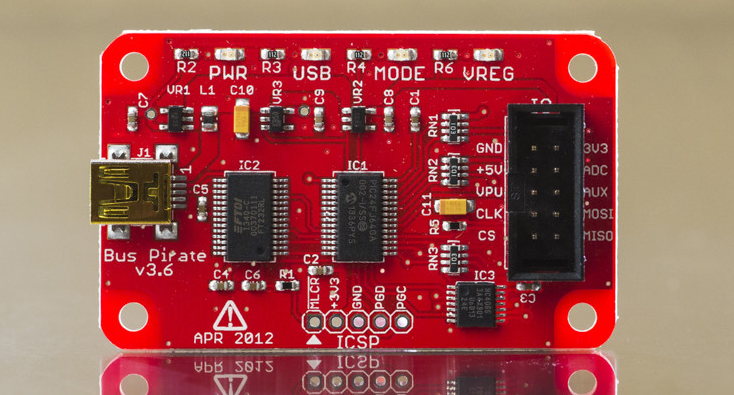 You have until February 15th to come up with a great project idea for a Smoothieboard. The best 30 project ideas will be chosen, and those projects will get a Smoothieboard. Actually building a project in a month isn’t a condition of the contest; the best idea wins. The guys from Bloomington’s Fraternal Order of Lock Sport (FOOLS) sure know how to throw a party! 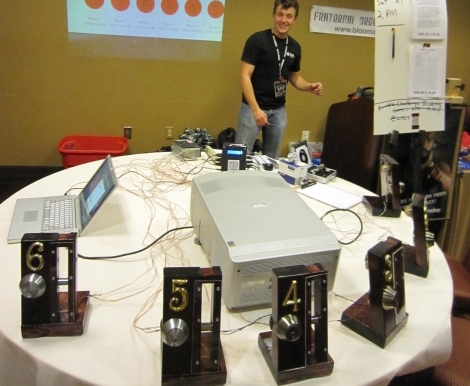 At this year’s DerbyCon event down in Louisville, the group put on an awesome event that combined lockpicking and drinking – what could be better? The Rumble Challenge is lock picking game where six people compete head to head for the best time. Whenever a competitor masters his lock, the competition is paused so that each player has a chance to take a shot from their air-powered shot dispensing machine. Once everyone has imbibed, the next round starts with the competitors picking up where they left off, in an effort to be the next to successfully open his lock. The game is controlled by an Arduino, which both times the competition and senses when the locks have been opened. The Arduino relays this data to a computer, which uses a projector to display the contestant’s scores on a big screen. As an added bonus, FOOLS member [dosman] added loud rumble motors to the locking mechanisms in order to throw competitors off their game. The contest sounds like a ton of fun – we’re bummed that we missed it. If you want to see how the game was put together, check out [dosman’s] build log over at the Bloominglabs wiki.